In Rome & Jerusalem, Moses Hess argued that Europe would never fully welcome the Jews, that they would always be hated outsiders. Therefore, the Jews must return to Palestine to build a socialist agricultural society there. 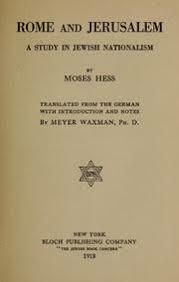 This book introduced the idea that Jewish identity could be expressed in nationalism, not religion. The idea of Jewish self-determination, when combined with the spiritual notion of returning to the Jewish homeland in Palestine, is what makes the root of Zionism. 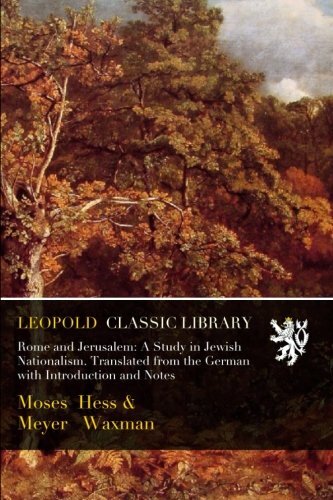 Written as a series of twelve letters to a grieving woman, Rome & Jerusalem sought to place this concept of Jewish nationalism within the wider context of European nationalism to argue against German-Jewish assimilation. It didn’t become popular until Theodore Herzl revitalized its ideas in his own writings later in the century.